The colon is seriously underrated part of the human body. It extracts water, salt, vitamins and nutrients from the food we eat, helps to break down foods that made it through the large intestine intact, and is critical to eliminating solid waste from the body. Without it, we’d probably explode in a shower of stinky half-digested food. But not only does your colon get very little credit for all the hard work it does, chances are it’s struggling to deal with the constant array of nasty food you’re putting into your body every day. In fact, the average American has a whopping 20 pounds of toxic waste stuck to the inside of their colon, preventing the absorption of nutrients from the food we eat and impeding the process of waste production and removal. As these toxic wastes continue to accumulate in your colon, your body suffers. With fewer nutrients being absorbed from your food, you have to eat more in order to make up the nutrient deficit in your cells and organs. But that creates a new problem, as the colon finds it harder and harder to expel waste with all those toxic deposits clogging up the pipe. Your gut bacteria begins to go downhill, and your weight starts to surge. The vicious cycle continues. So what’s the solution? How do you give your colon some much needed TLC and let it get back to its job? A colon cleanse, of course! 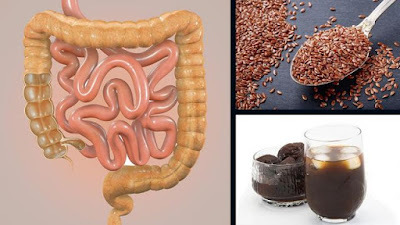 Here are six ways to cleanse your colon easily and naturally. It just so happens that one of the most effective ways to cleanse and detoxify your colon is also one of the easiest: drink more water! And considering 75 percent of Americans are chronically dehydrated, this advice could go a long way towards improving not only the state of their colon, but their health in general. Broadly speaking, the more water you drink, the easier it is for your colon to process and expel waste — meaning there are fewer nasty toxins hanging around like a bad smell. So how much is enough? If you’re serious about your colon cleanse, aim for between 10-12 glasses of water per day. Doing this for up to a week can help to flush out the accumulated toxins and get your colon back on track. There is, however, a way to make the colon-cleansing abilities of water go even further: create your own alkaline water. Research shows that the human colon is healthiest when pH levels are more basic (alkaline), meaning the more alkalizing agents you consume, the stronger your colon will be. Alkaline water helps to restore healthy pH levels in the colon and help to speed the removal of toxic deposits lining the colon walls. To make your own alkaline water at home, simply add a teaspoon of baking soda and sea salt, along with the juice of a whole lemon, into a gallon of filtered water. Mix thoroughly, then drink! But be warned: flushing so much water through your body means you’ll also be losing a lot of electrolytes, so be sure to keep you stocks up with plenty of fresh vegetables, unrefined salt, and the occasional fresh fruit juice. Flaxseed is loaded with omega-3 fatty acids and boasts the highest fiber content of any grain – making it a great choice for a colon cleanse. The omega-3s in flaxseed help to loosen and relax the colon, while fiber (as you’re probably well aware) is great for ensuring there’s plenty of throughput (let’s call it “pooput”), thereby helping to flush out excess toxins. Slip flaxseed into your morning cereal or oatmeal, slap it into your baking, or just slop it into your smoothie – the options are virtually endless! Personally, I consider a day without a glass of freshly squeezed lemon juice and water a less than ideal day. The high citric and ascorbic acid content of lemon juice, combined with its low sugar content, makes it a great choice for cleansing your entire digestive tract… including your colon. Simply mix 1 to two teaspoons of lemon juice in a glass of room temperature water and drink it all back first thing in the morning. There’s a reason why people often turn to prunes when they’re feeling a little “bunged up”: it contains epic proportions of fiber – enough to get even the most constipated person rushing for the nearest toilet. That same “flushing effect” of prune juice makes it a great candidate for cleansing the colon, as more regular pooping means more rapid removal of accumulated toxins. If you’re a bit blocked up, consider taking around 8 ounces of prune juice in the morning and another 8 ounces in the evening. Once things start moving along nicely, you can start easing off on the prunes. If there’s one thing I might like even more than lemon juice, it’s a generous dash of apple cider vinegar (ACV). I use raw apple cider vinegar in everything – I splash it onto my salads, use it to draw out nutrients in my bone broth, clean with it, wash my hair with it, drink it in a glass of water when my stomach is a bit topsy-turvy… the list goes on. And the same properties in ACV that make it such a great all-rounder can also be utilized for a good colon cleanse. The ascorbic, ascetic, malic and lactic acids in ACV help it to cut through the hardened toxic sludge lining your colon, while the vitamin C helps to keep your digestion healthy and moving along nicely. There’s no need to bust out some fancy recipe for your ACV colon cleanse: simply mix 1 to two tablespoons of raw apple cider vinegar into a glass of room temperature water and drink it back in the morning, similar to what you did with the lemon juice. Ginger has long been a go-to natural remedy for most forms of digestive upset, and for good reason: it can simultaneously calm a settled stomach and get a sluggish digestive system moving again. It’s thought that this is due to the warming effect ginger exerts once it’s ingested — whatever the reason, the all-around digestive abilities of ginger, along with its cleansing effect, make it a good choice for giving your colon some much needed TLC. I simply grate 1 to 2 teaspoons of fresh ginger root into a tea strainer then pour in some boiling water, let it steep for 10 minutes, and drink it once or twice a day. Ginger is such a wondrous health food that you can continue drinking your ginger tea well after your colonic woes are a thing of the past.